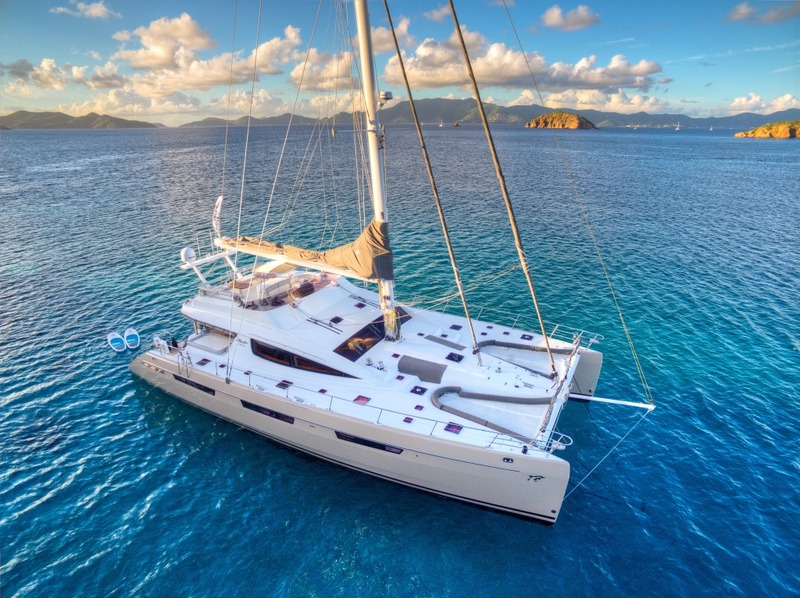 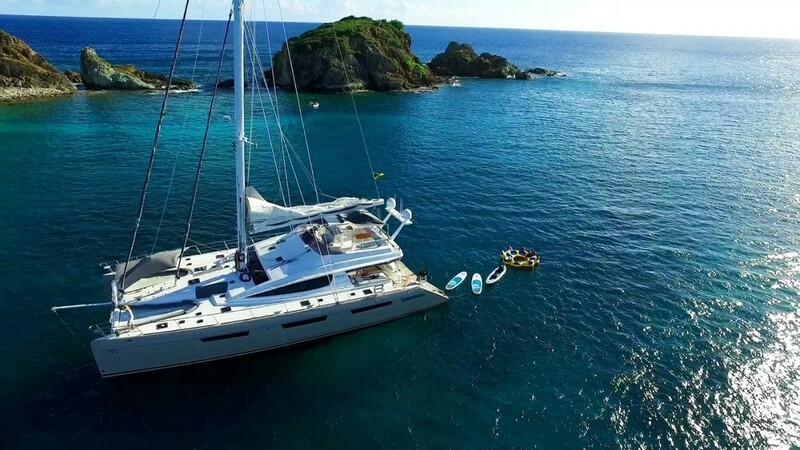 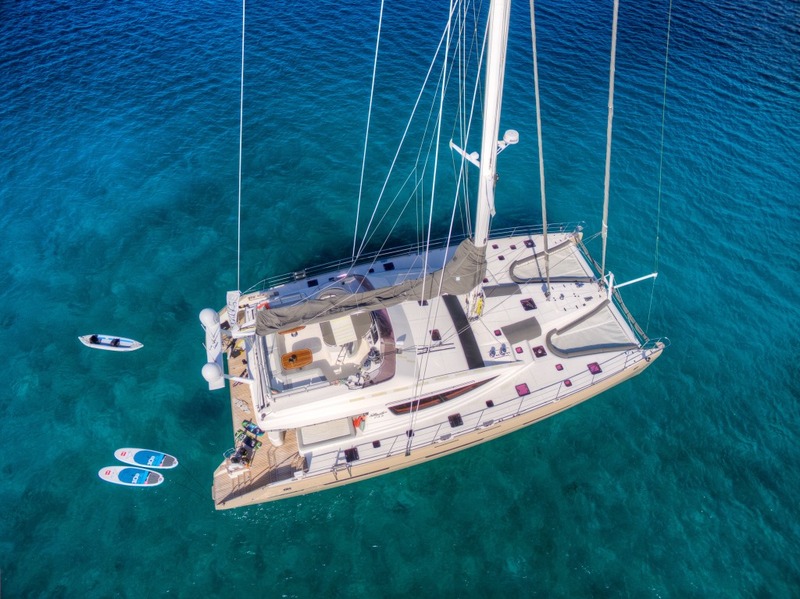 Sailing catamaran XENIA 74 (Ex Lady Alliaura 2) was built in 2012 by Alliaura Marine Group and refitted in 2015. 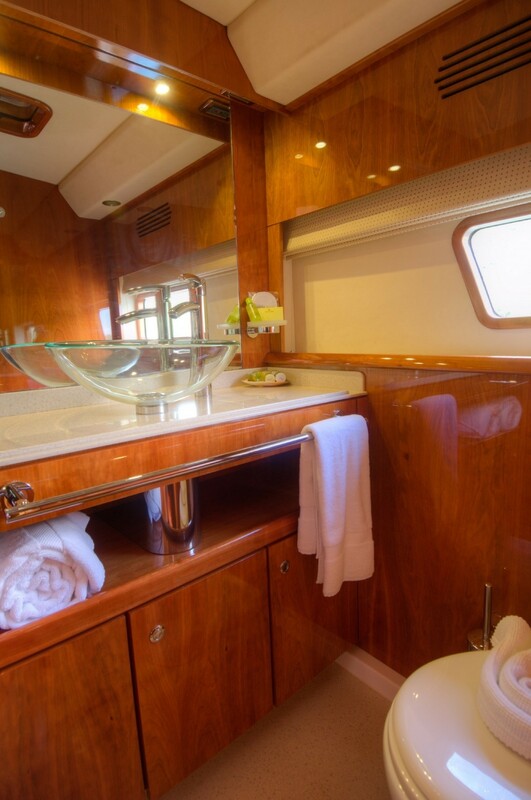 The yacht measures 22,8m (75ft) and can accommodate up to 8 charter guests, in 4 spacious cabins. 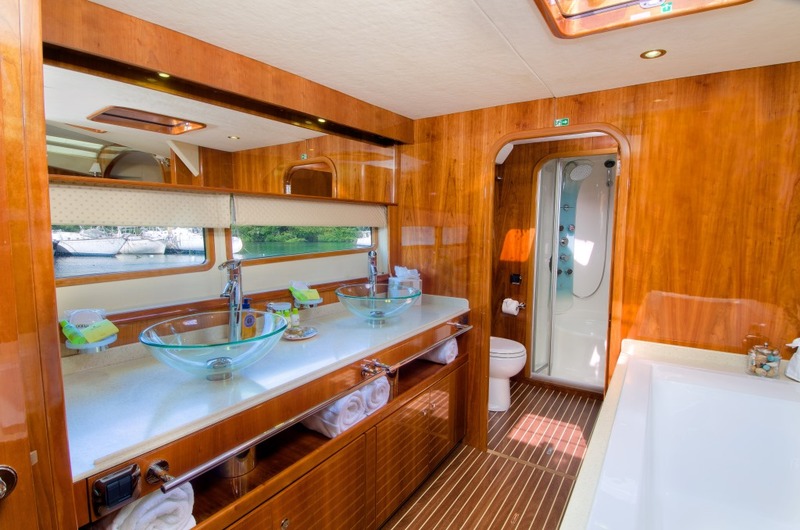 The interior décor is timeless and elegant, featuring neutral soft furnishings, high gloss panels and teak and holly inlaid floors throughout. 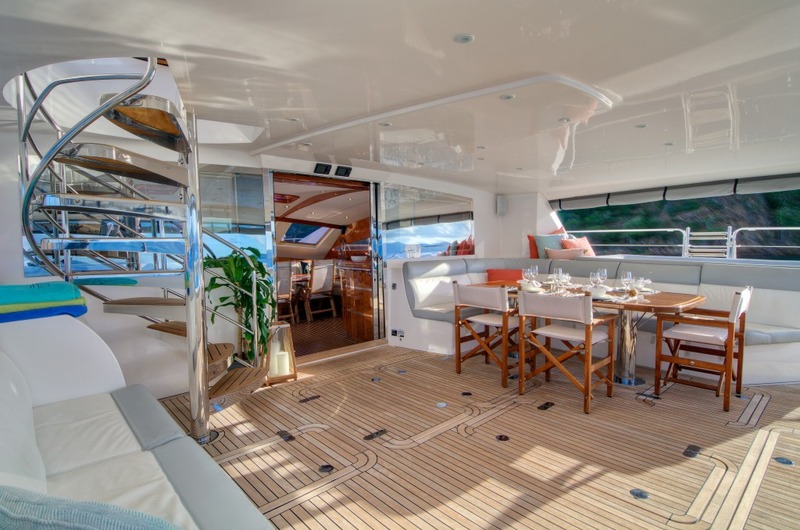 The main salon is open and airy thanks to wrap around windows and wide sliding glass doors. 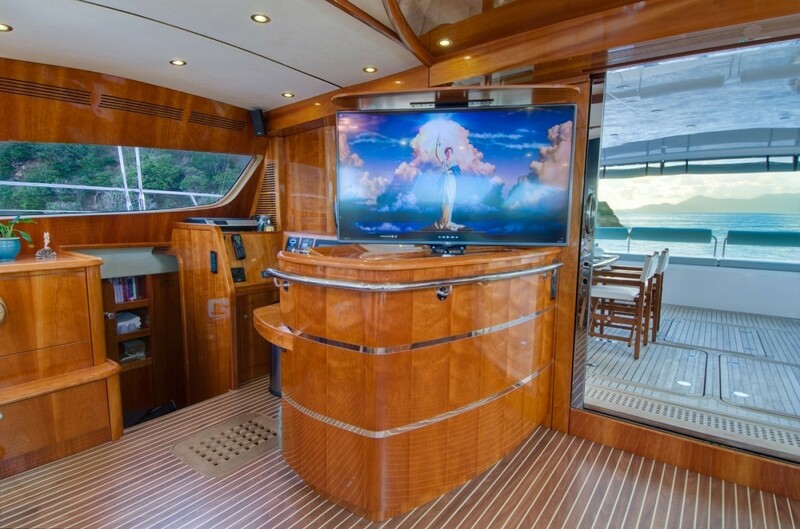 Upon entering the salon, to port is a glass topped wet bar, while to starboard is the navigation station, and state of the art entertainment center. 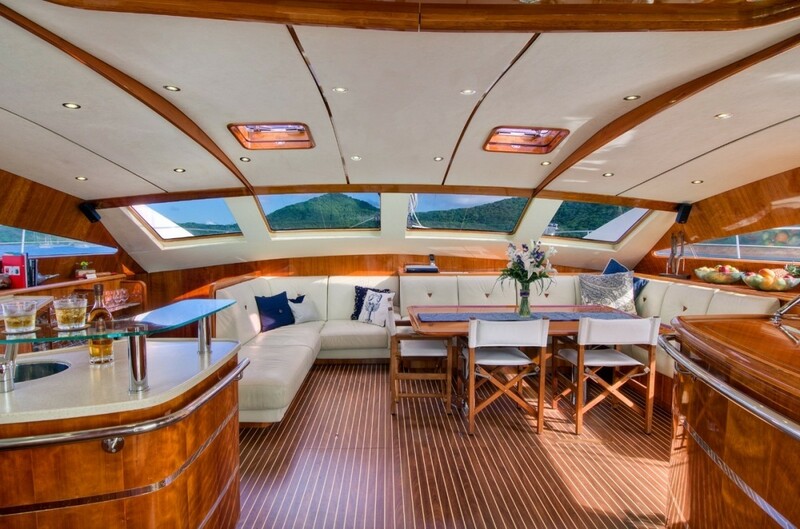 Forward in the salon is a generous leather seating area and formal dining table. 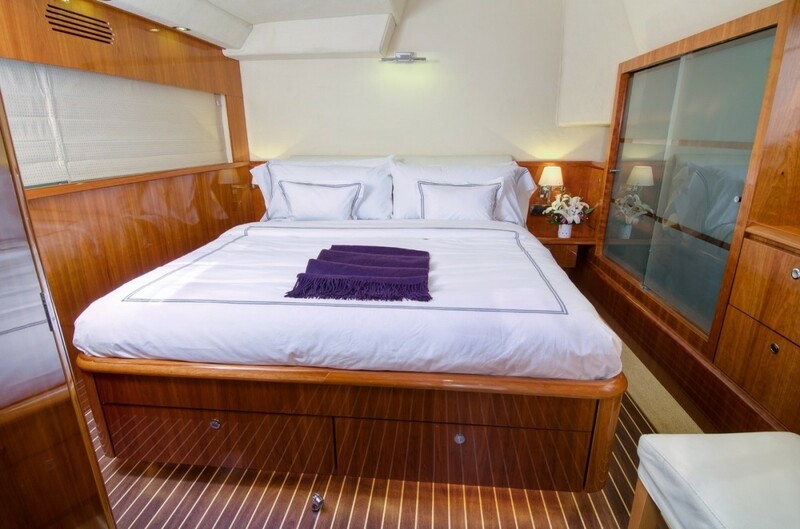 Guest accommodation is in 4 double cabins, 1 master suite and 3 queen suites. 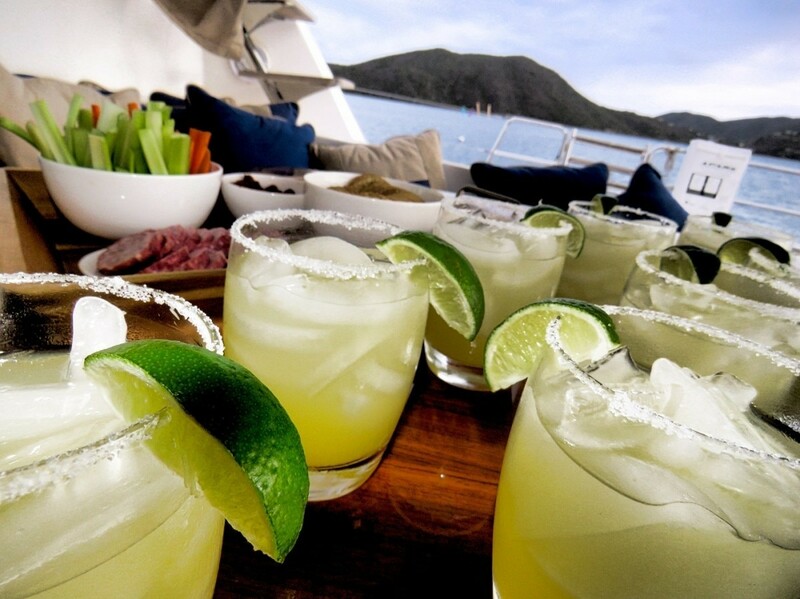 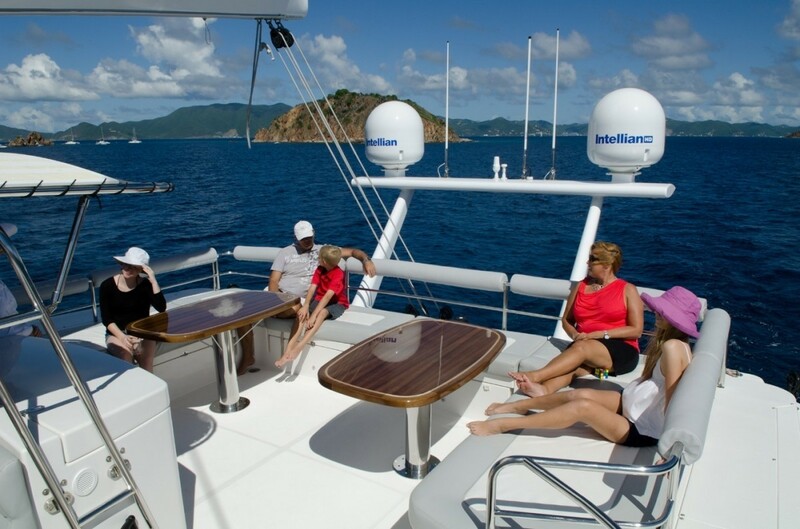 On deck guests can relax in a choice of sun filled or shaded areas. 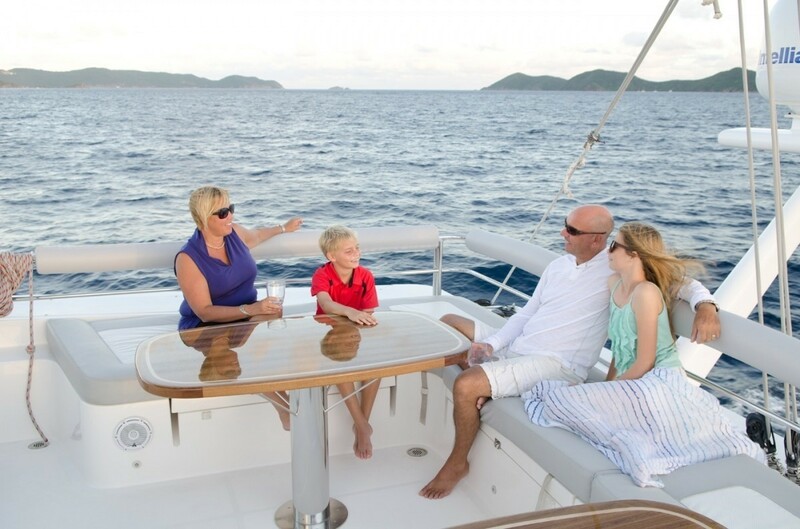 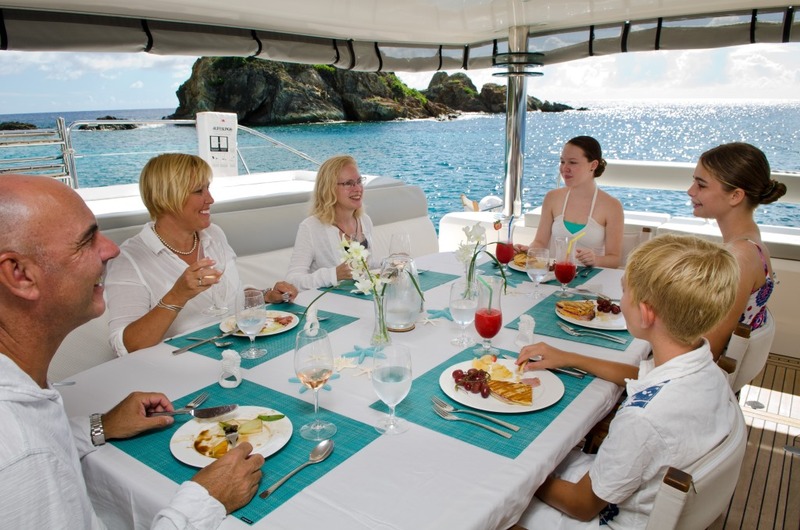 The aft deck is adjacent to the salon and boasts an alfresco dining table, plenty of seating and shade. 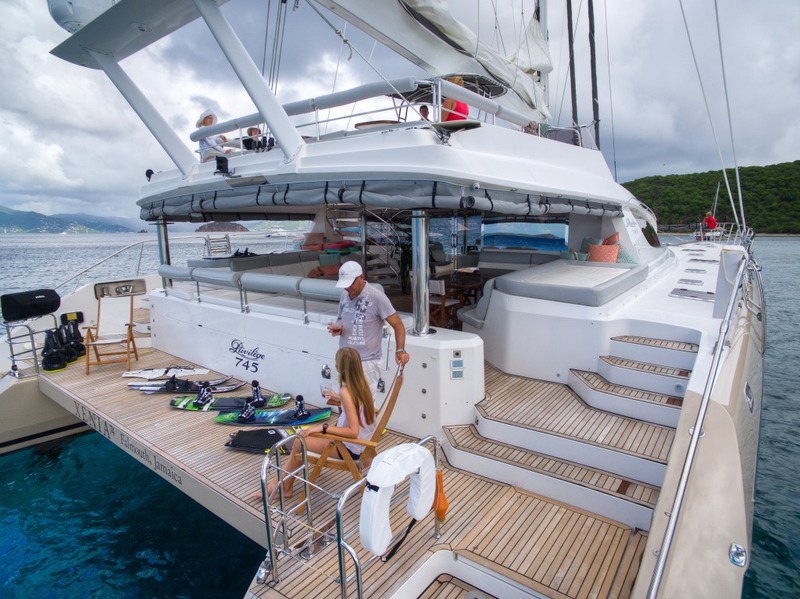 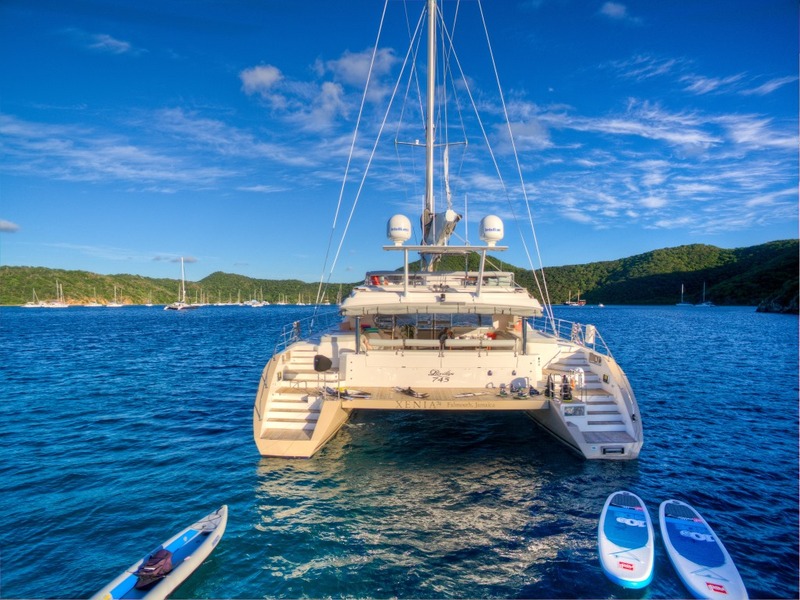 Dual transoms are joined by an overpass teak deck, making the entire aft section of the yacht the perfect water sports station, or alternatively a fabulous teak beach, ideal for spectacular sunsets. 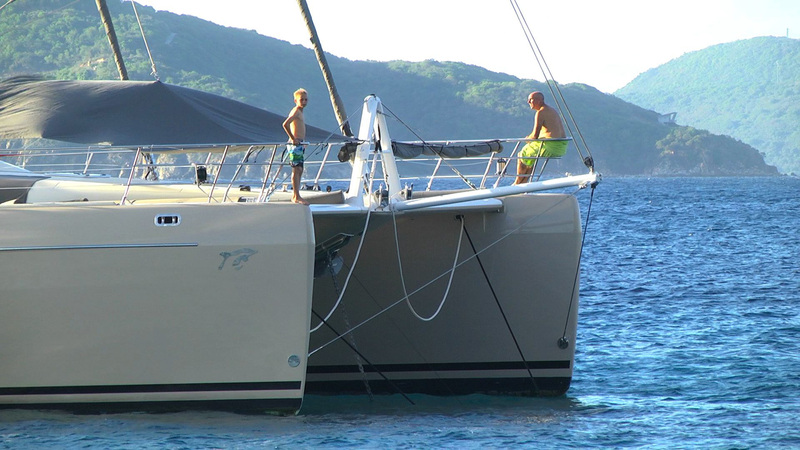 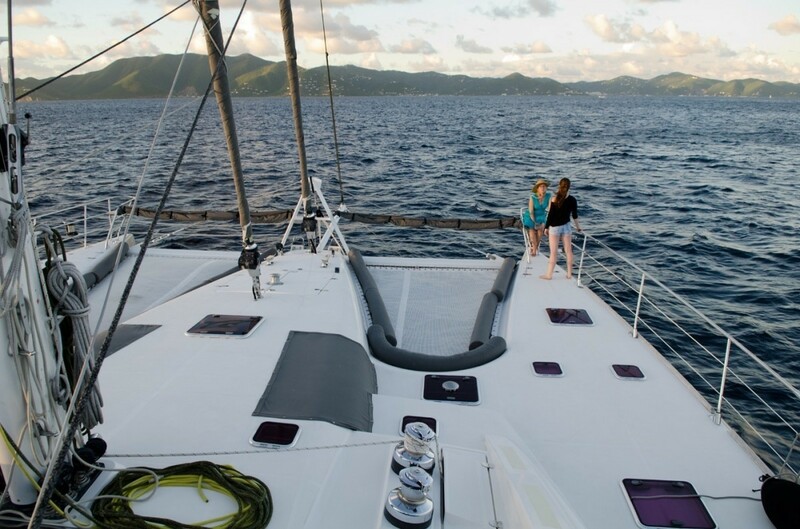 On the foredeck are 2 safety trampolines, popular with the sun lovers in the group. 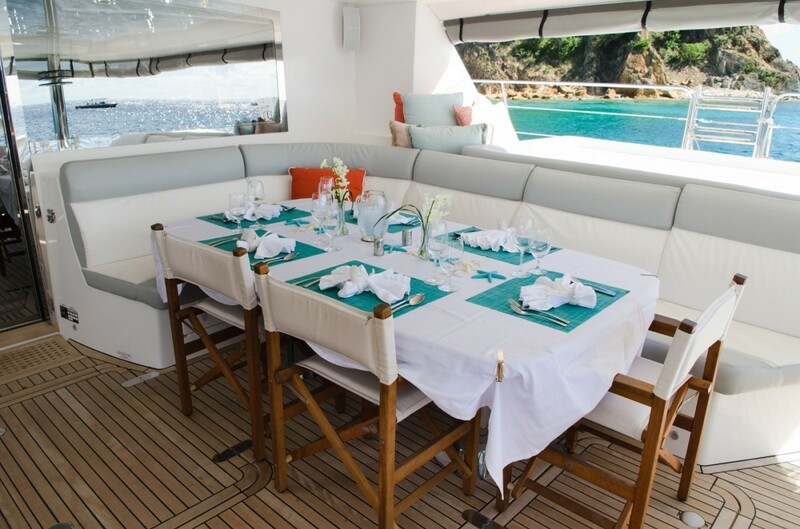 An upper deck boasts wrap around seating and 2 alfresco dining tables. 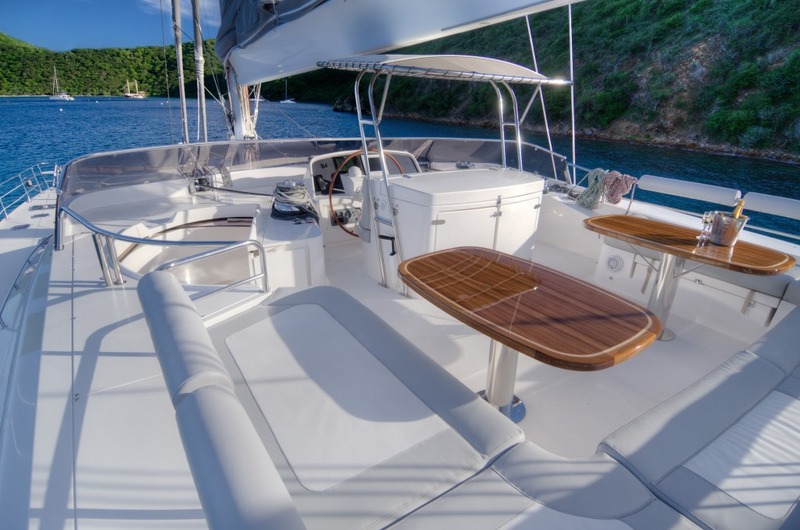 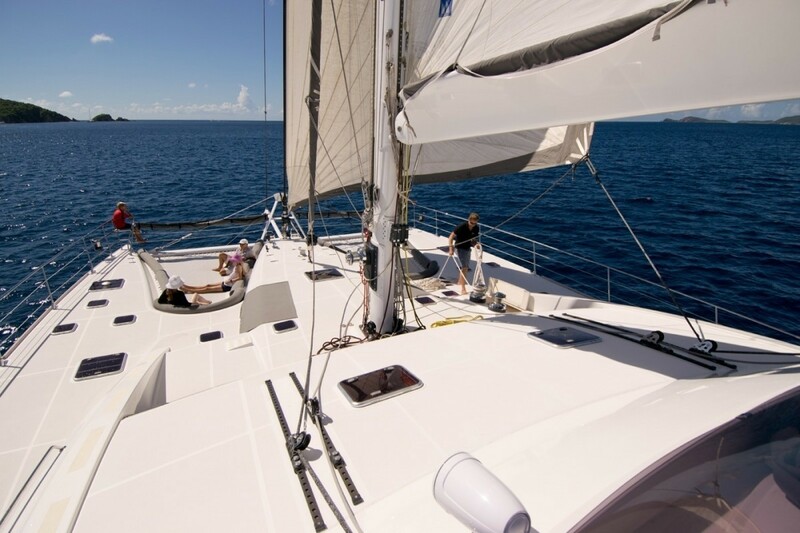 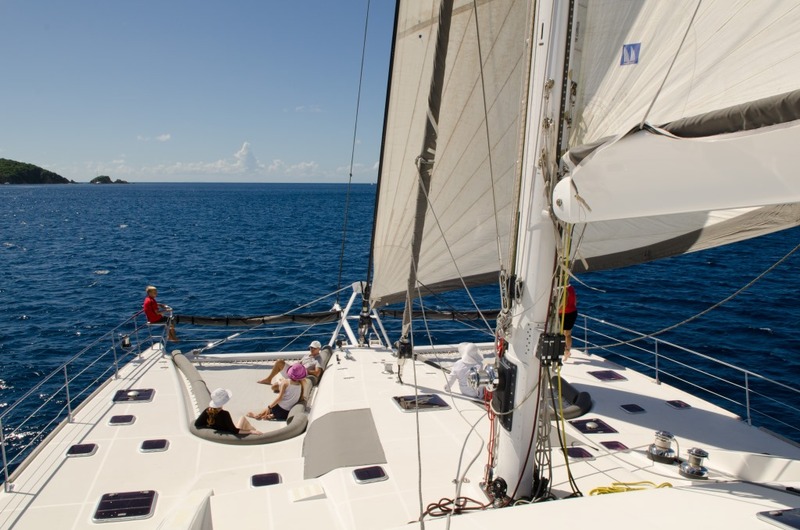 Optional shade is available on both the foredeck and the upper deck. 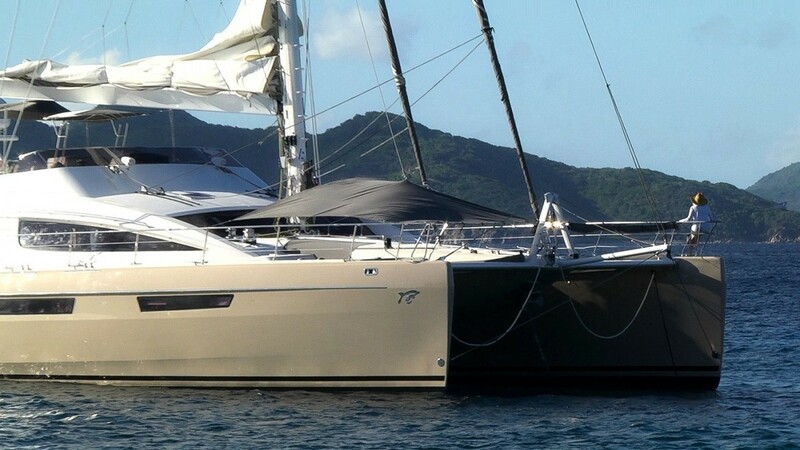 S/Y XENIA 74 is powered by 2 x 320hp Turbo engines, she can cruise at speeds of 11 knots. 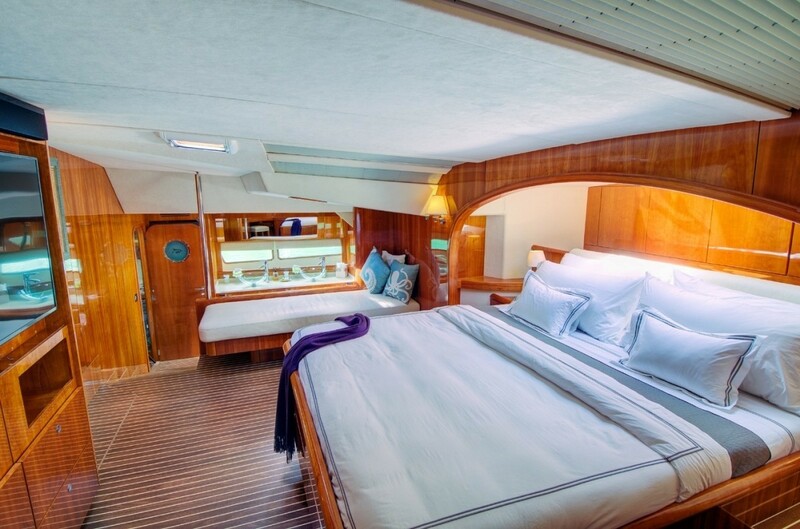 Below decks are 1 master cabin and 3 guest cabins. 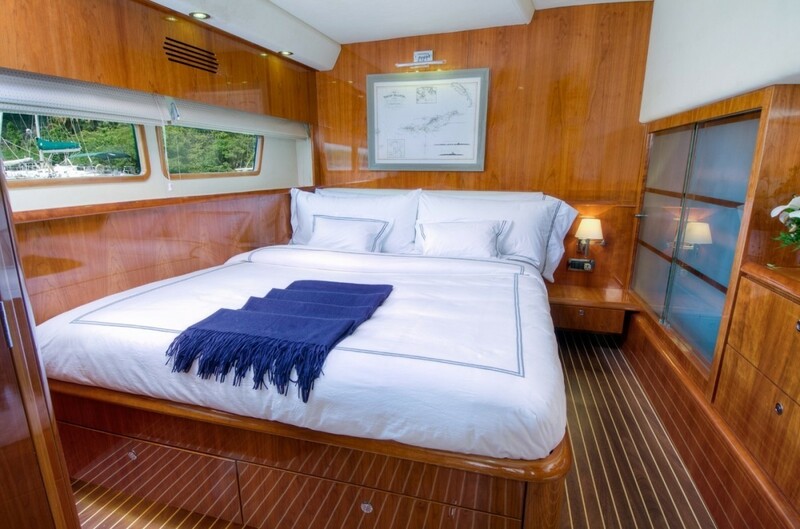 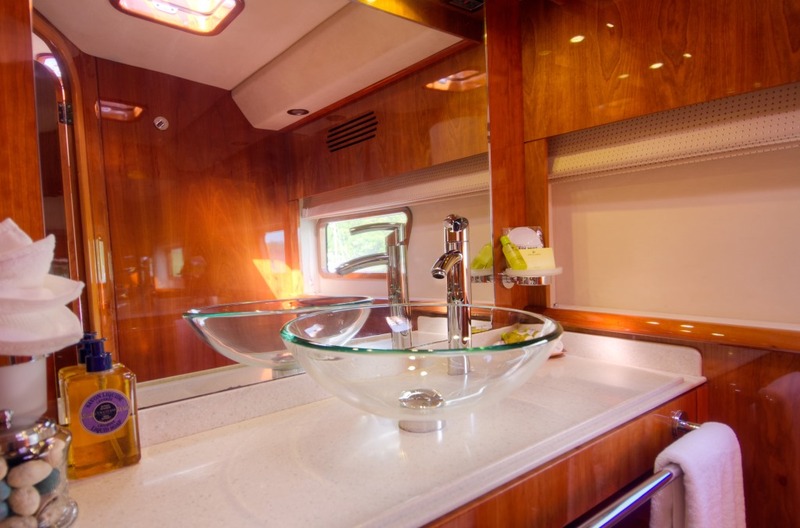 The master suite is almost full beam of the yacht forward, with a king size center lined bed, sofa, vanity and en-suit with dual sinks and a Jacuzzi tub. 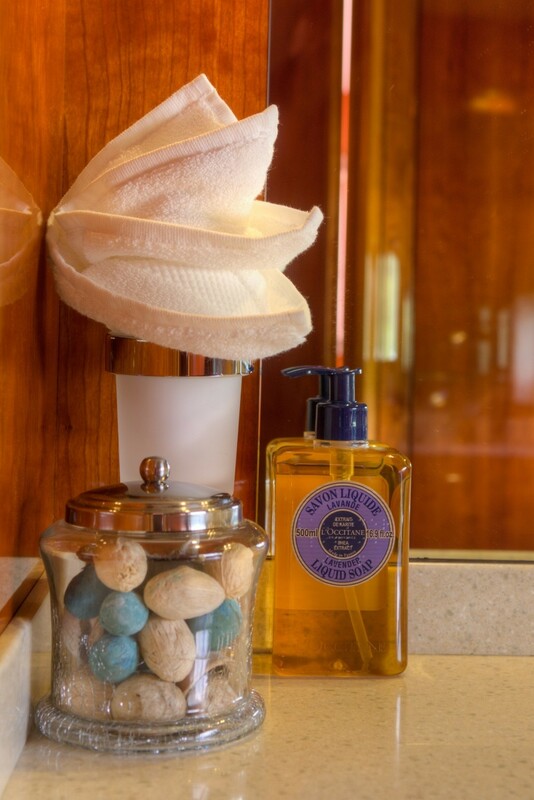 Three guest cabins are on port and starboard and offer queen size beds, each private en-suite has a luxury hydro massage shower. 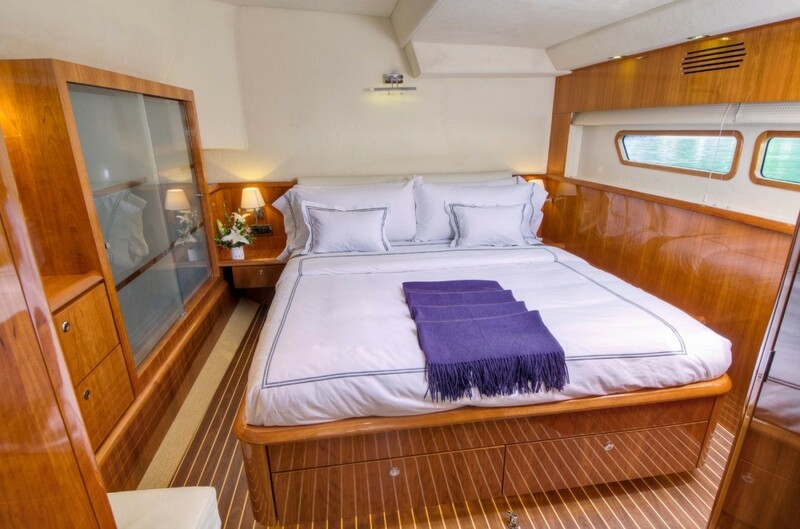 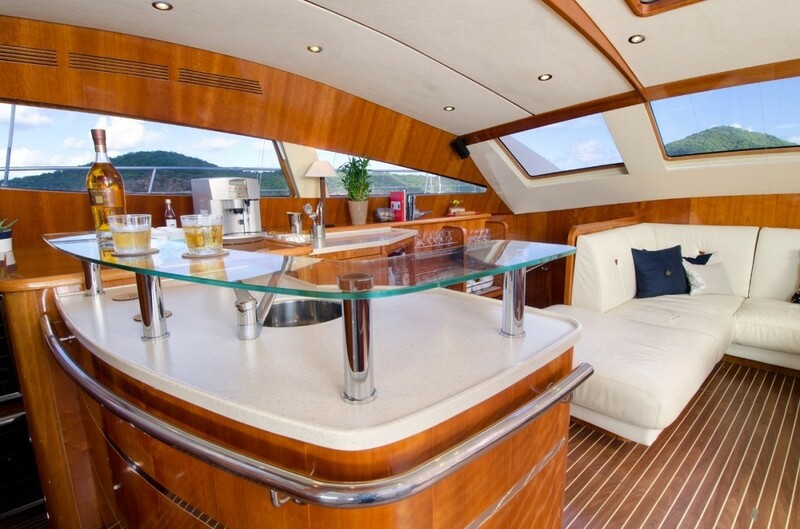 The Privilege model yacht is fully air conditioned, providing optimum comfort.